Birgit’s energetic works show a lush world, where nature is in constant celebration. Orchids, verdant gardens, and imaginary spaces become synonym with sanctuaries. Deeply inspired by the beauty of flowers and landscapes, Huttemann-Holz pushes her subject to a place of gestural abstraction with sweeping gestures, layering curves, and punctuating forms of saturated tones. 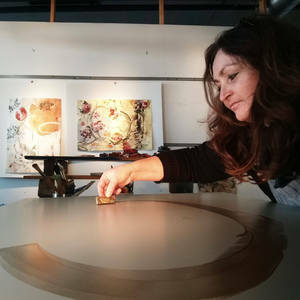 She employs a myriad of media, including encaustic, oil, acrylic, encaustic monotype and even throwing and painting ceramics. Birgit Huttemann-Holz depicts both her vision and feeling of a world where beauty and vulnerability are the touching keystones. She has exhibited nationally and internationally and is represented in Germany, The Netherlands, and in the US. She was awarded Finalist of the International Portrait Competition, Society for Art of Imagination, UK (2011), Best of Show, Platform Award, OK (2013), Best of Show, NANA 14, FL (2014) and won multiple awards nationwide. Her work was selected for Studio Visit Magazine, winter edition 2013, spring edition 2017, for the Palm Award, Germany (Certificate of Excellence), 2015, Saatchi Collections "New This Week", April 2014, January 2018,” Inspired by Cy Twombly” April 2018, “ Inspired by Jackson Pollock” Jan 2019, The Other Art Fair, Brooklyn, NY, Nov 2017 and May 2018, and The Other Art Fair Chicago, IL, September 2018. In February 2017, she attended a month-long residency at The Studios of Key West. Her book "Enkaustik- Das Grundlagenbuch zur Wachsmalerei" was published April 2015 by Christopherus Verlag, Germany and translated into English in 2017, “How to create Encaustic Art- A guide to painting with wax”. “Wachsmalerei- Birgit Huttemann-Holz”, a tutorial video and three documentations were published in 2016/2017 with the group “geistreich-lernen.de”, Germany Birgit Is showing her new work @The Other Art Fair Brooklyn, NY and Chicago, IL in May 2019. Huttemann-Holz lives and works in Detroit, USA.